UP Board NCERT Exam Pattern 2019 | NCERT 40 Model Papers pdf download For UP Board Students | English Hindi Physics Chemistry | UP Board NCERT Short Long Answer type question. UP Board NCERT Exam Pattern 2019 Students who will sit for UP Board Exam 2019, they have to follow the NCERT 10TH 12TH Exam Pattern 2018. From the meaning of previous line means UP Board all exam paper will come according to NCERT Syllabus 2019. For More details on UP Board NCERT English Pattern you can check it at official webiste where 40 types of UP Board NCERT Question Papers is available. For your kind information if any Exam of UP Board is change or any major update comes than we intimate you for NCERT Model Papers for UP Board. UP Board NCERT 40 Model Papers: After downloading pdf of UP BOARD NCERT Syllabus (English, Hindi, Maths, Science, Sanskrit etc) we recognize that Less Question and More marks. So you can know the difference between UP Board Syllabus Vs CBSE Board Syllabus. 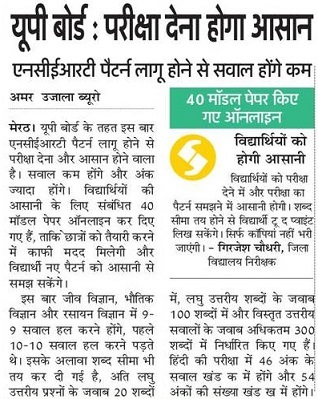 CBSE (Central Board of Secondary Education always follow thet NCERT Pattern) and cbse students able to qualify in 10th 12th written exam with Tope, Higher marks etc. I am also UP Board students of 2010 and opt 61.1 marks in Highschool, 65 marks in Intermediate and BCA (Bachelor in Computer Application) improve my marks quality (75%). UP Board NCERT Syllabus: Latest News Main Objective of Introducing UP Board NCERT Exam syllabus is marks building process. And you can compare marks of UP Board and CBSE students their is big difference in marks and calculation of UP Board and cbse (winner). UP Board NCERT Question Papers 2019: In Chemistry, Physics and Biology papers only 1 question is decuted from previous 10 question. Total 9 unsolved question comes from UP Board ncert Biology, Chemistry and Physics papers. NCERT UP Board Model Papers Online 2018: you may solve Extra Short question (ati laghu uttariya question) in 20 words. In 100 words you have to solve short answer type question. UP Board ncert long question how to solve: in 300 words you may solve long answer. For more details on NCERT Change pattern of UP BOARD you may check below advertisement.